Hi, foodies...Welcome to AYESHA'S KITCHEN. 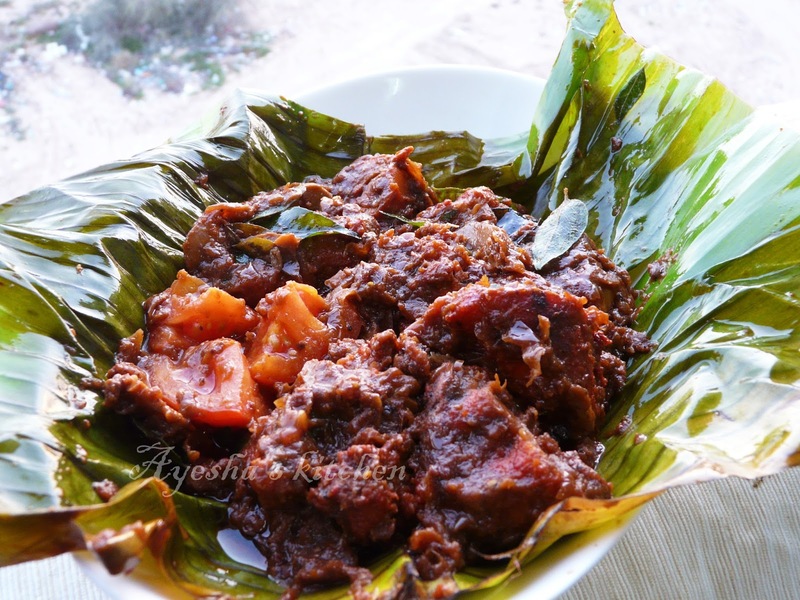 Today's recipe is a must try chicken recipe with the fine lovely aroma of banana leaf, inside which the chicken is cooked. 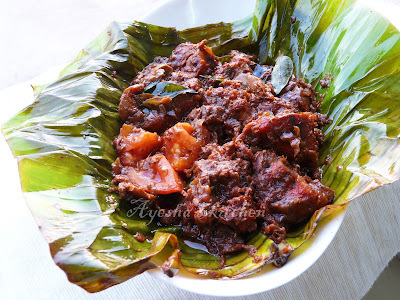 Here chicken is shallow fried, and then cooked in the banana leaf along with the sauteed thick gravy.This is a tasty aromatic chicken recipe from the gods own country, Kerala. Usually, the Keralites prepare this dish with fish instead of chicken which is known as karimeen pollichathu / Pearl spot fish pollichathu. So let's see how to cook chicken in banana leaf wrap. Grind together all those ingredients for marination and marinate the chicken with that paste, keep refrigerated for minimum 15 minutes(preferably 2 hours). Now heat oil in a pan and shallow fry the chicken pieces in a medium flame. Set aside. Do not over fry the chicken. Now we have to prepare the gravy. So heat oil in a wok. Saute finely chopped shallots, ginger garlic pastes until golden and then add chopped tomato along with garam masala powder, turmeric powder, chili powder, coriander powder, fennel seed powder, and salt. Cook it in low flame, until the oil separates and tomatoes become mushy. Adjust the spices according to your taste and add curd. Cook till it blends nicely with the masala. Finally, add some coriander leaves and curry leaves. Remove from flame. Now the next step is wrapping the chicken in banana leaf. Take the desired size plantain leaf and wash it. Place half of the gravy over it and keep the fried chicken, then place the remaining gravy over the chicken. Now cover and wrap the plantain leaf like a closed parcel. You can also cover the entire parcel in a foil. Heat a tawa or pan with 1 tsp of oil.When hot place the chicken wrap and cover the pan with a lid. Cook it in low flame for 5 -8 minutes on each side.